Here's my updated final call for the snow on Tuesday. The models are indicating a moderate band setting up during the early part of the day somewhere right along and east of the I81 corridor. This will be from the northern stream swinging through. I think accumulations will be very elevation-dependent with the winners being along the higher elevations of the Allegheny Mountains and up in the Blue Ridge. Once this batch moves out, upslope snow will kick in Tuesday night for western facing slopes. I still think late march sun angle and recent warm temperatures limits accumulations for most lower-elevation areas. There really hasn't been many changes in regards to our next storm threat on Tuesday. The main low pressure area is still set to miss well east. 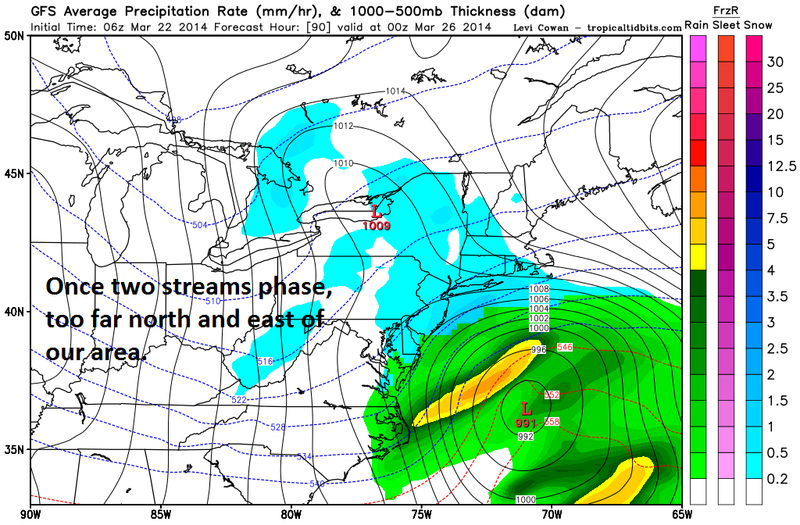 With that being said, the upper level (northern stream) energy still looks to swing through the area on Tuesday bringing widespread rain/snow showers. It's looking like we may even get an inverted trough to form as some of this energy starts consolidating with the coastal system. This may enhance precipitation along, especially along I95, during the later part of the day on Tuesday. The timing of this batch of precipitation looks to occur mainly during the day, so I don't expect much in the way of accumulation. Sun angle and warm ground temperatures will be tough to beat. It will be interesting to see how much precipitation from the inverted trough hangs around after sunset Tuesday evening. In my first call map below, I highlighted an area right around the DC/Fredericksburg area where I think an inch or two may fall. This is highly dependent on snow hanging around after sunset. As the storm gets cranking and departs up the coast, winds will get cranking out of the northwest. 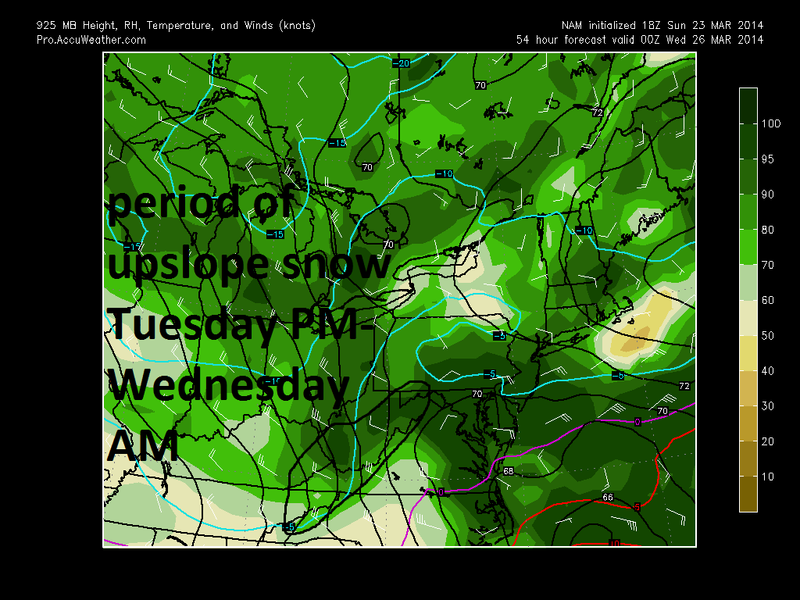 This will set the stage for a decent period of upslope snow Tuesday night into Wednesday morning. The typical upslope areas will likely squeeze several inches out of this. I wouldn't be surprised to see some bleed-over into the western Valleys (New River/Roanoke/Shenandoah) in the form of some flurries or light snow-showers. Taking all that into effect, here's how I see things shaping up. I think most people at least see some snowflakes during the day...but the majority don't see much in the way of accumulation. 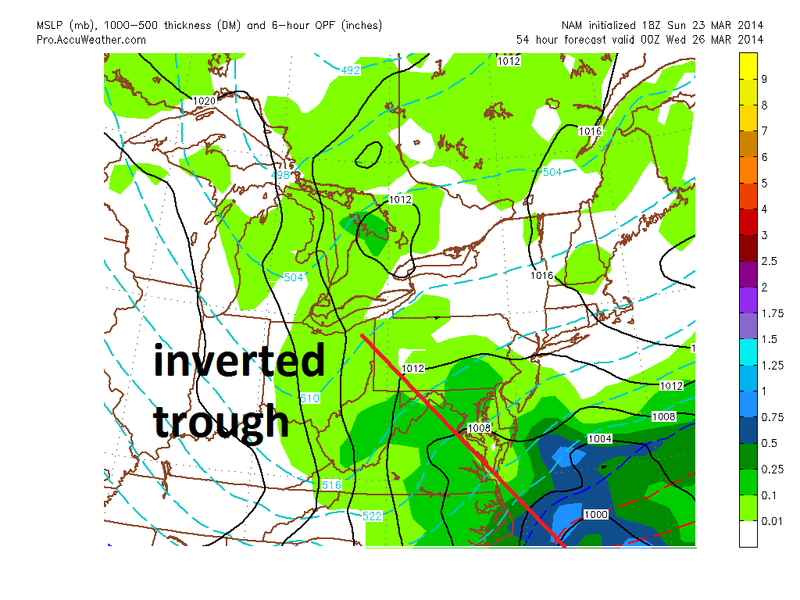 The leftover precipitation from the inverted trough along the coast is definitely a wild-card. I'll have an update on this sometime tomorrow. Today (Saturday) will be our last real warm day until at least the middle part of next week. A cold front will push through this afternoon before stalling out across the Carolinas overnight. On Sunday, a weak wave of low pressure will ride along this stalled boundary producing a light area of precipitation across the southern 1/3rd of the state. Most areas will see plain rain. 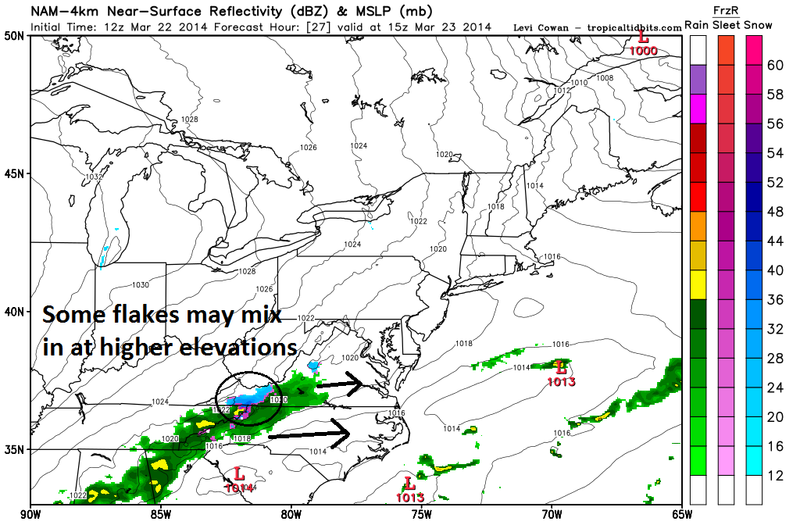 The exception may be some of the highest elevations of southwestern Virginia where some wet snow flakes may mix in. Even here, above freezing temperatures, warm ground, and late-March sun angle will prevent much, if any, in the way of accumulation. 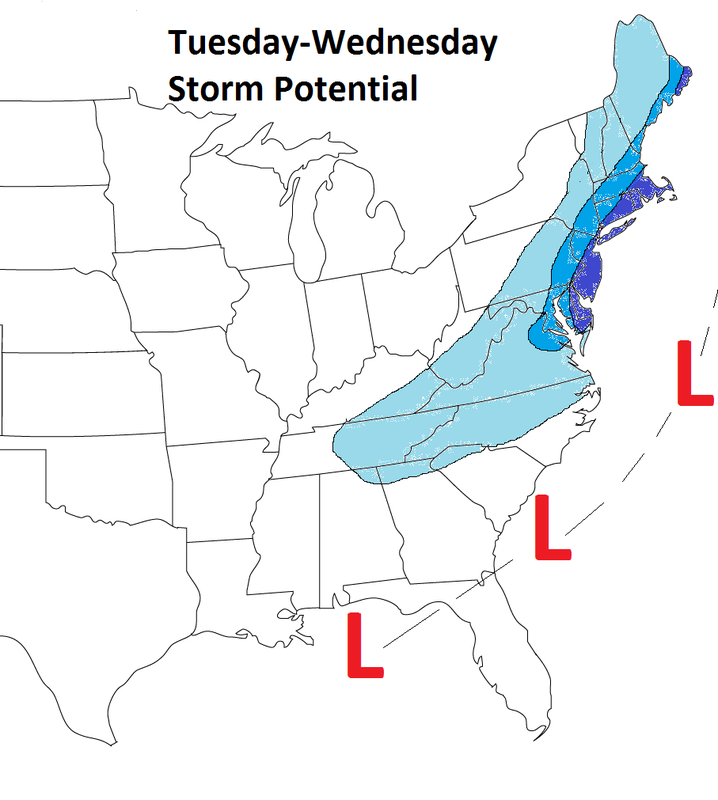 No real changes in thinking for the Tuesday system (see original post below). There will likely be some snow showers scattered about the area on Tuesday. This will be mostly from the northern stream system that will be swinging through the Ohio Valley. There may be some light higher-elevation accumulations, but once again this will be mostly light and occurring during the peak day-time heating hours of the day when late-March sun angle does its work. The system will finally phase off shore, but not until its too far east and north to significantly effect our area. This will still end up being a decent storm for immediate coastal areas of the northeast. As this system departs, there will be two things worth watching for our area. 1) Winds will crank up behind it, likely leading to some wind advisories/high wind warnings Tuesday night into Wednesday. 2) There could be a period of upslope snow across the mountains of southwest VA/West Virginia Tuesday night into Wednesday. 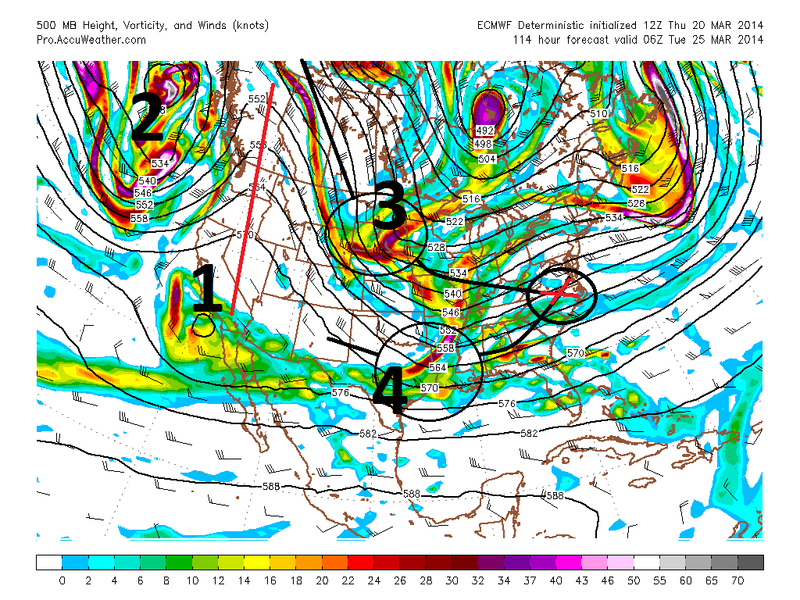 Thoughts remain the same regarding next week's storm. Overnight models further support the idea that this is a Mason-Dixon line and points north storm. The 00z euro ensemble mean even jumped away from a big snow for the southern mid-Atlantic. The setup just isn't favoring a major VA snowstorm. 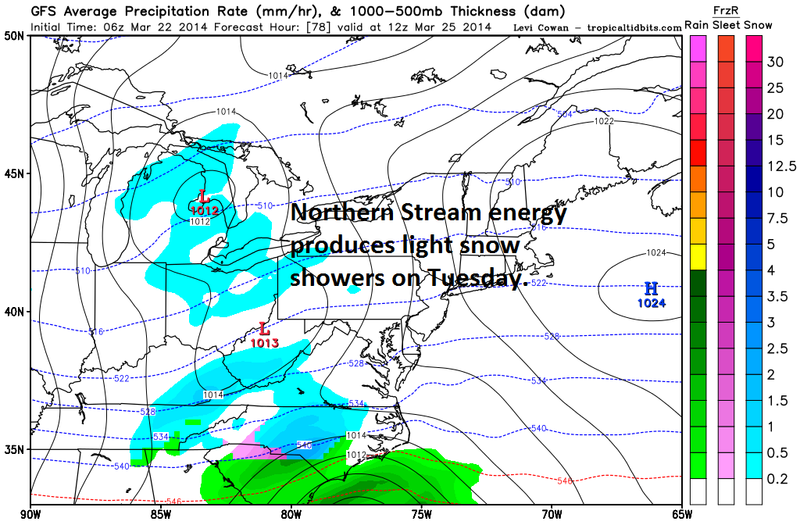 Many will see snow showers around during the day on Tuesday. Of course snow falling during the day during late March has to be pretty heavy for it to accumulate with the higher sun angle. I've gotten a lot of questions regarding the storm next week so figured I'd go ahead and put out my current thoughts. Our overall pattern still isn't the most supportive of a major Virginia snowstorm, but we've seen this winter that we can thread the needle to get snow even during unfavorable patterns. A cold front will swing through the east late in the day on Saturday. A trough will dig into the east behind it making the early part of next week feel more like early February than late March. Some energy diving out of Canada will break off and round the base of the trough, developing low pressure across the southeast or northern Gulf. From here, this low will track somewhere just off the coast into the northeast. The storm will really strengthen once this piece of energy phases with the northern stream, likely occurring not until after it reaches our latitude. Right now, I'm leaning away from a widespread Virginia snow storm. I think the two pieces of energy that we need to phase to really blow this storm up come together a bit too late. The exception may be for areas along and east of I-95 (particularly the farther north you go), where they will be closer to the low when it takes off. Here (the area north of Richmond to DC) there will be a better chance for minor accumulating snow. With that being said, at least some snow will still be possible across the rest of the state as the northern stream energy swings across and begins to partially phase with the energy coming up the coast. With this storm impacting our area 5 days from now, there is plenty of time for minor changes upstream to significantly throw a wrench into how everything comes together across the east coast. The energy for our storm won't even make it into Canada until Sunday, so pay attention to the forecast through the weekend. You can jump below to find more in-depth analysis of why I see things playing out like I have them in the map below. 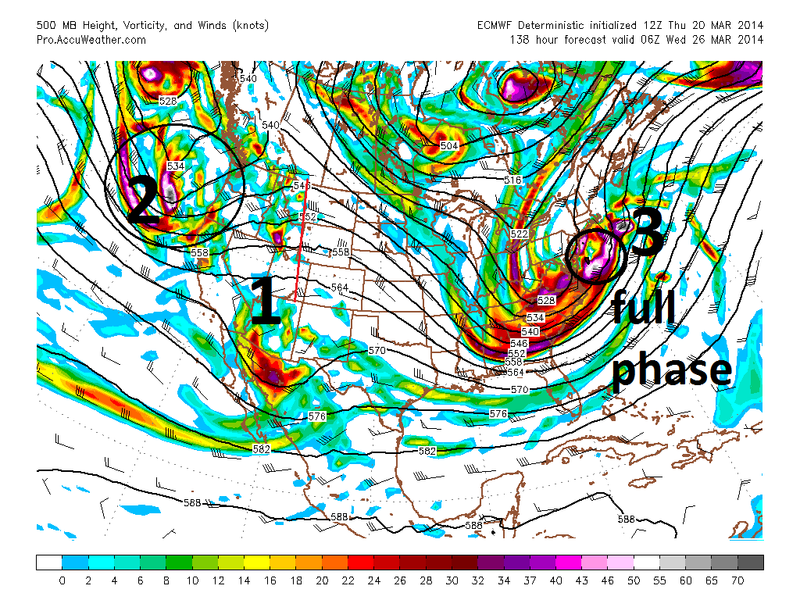 1) We usually need a ridge out west to produce significant VA snowstorms. The steeper our ridge, the more our trough in the east is able to dig. The more it digs, the chances of our storm strengthening early enough drastically improve. The flatter the ridge, we either see a storm strengthen too far north or simply one that goes out to sea. The red line represents our ridge and initially looks very good. I'll come back to this later. 2) While our storm is trying to get going across the southeast, another storm system will be getting ready to slam into the Pacific northwest and British Columbia. This isn't good for our ridge mentioned above for 2 reason. 1) it weakens it and 2) it pushes it farther east. 3/4) This is our energy that will be coming out of Canada to create our storm in the first place. A piece of this (4) will break off and round the base of the trough across the Gulf Coast states. Although this will help allow our low to form, it won't be until it meets up with the northern stream energy that it will really be allowed to get going. The red X represents the vicinity that we will start to see a partial phase. For this to be a widespread Virginia snowstorm, I'd like to see this occur farther south and west. Now here is 12 hours later with the same features labeled. 2) Pacific Northwest storm continues to push things east. 3/4) Because of 1 and 2, the trough doesn't dig all the way into Texas/Louisiana like we usually see with our bigger snowstorms. A partial phase between the two streams is beginning to occur. Same map 8 hours later. 3) Our 2 streams finally completely phase. This leads to rapid strengthening of our system but not until it has already bypassed most of our area (exception areas along northern I-95 in VA). This likely provides very heavy, wind-driven snow for coastal sections of the northeast. You can see that much of Virginia receives snow with the passage of the northern steam as it begins to interact with the southern stream. Once it fully phases (image on right), the storm really intensifies and brings quite the snowstorm to portions of New England. 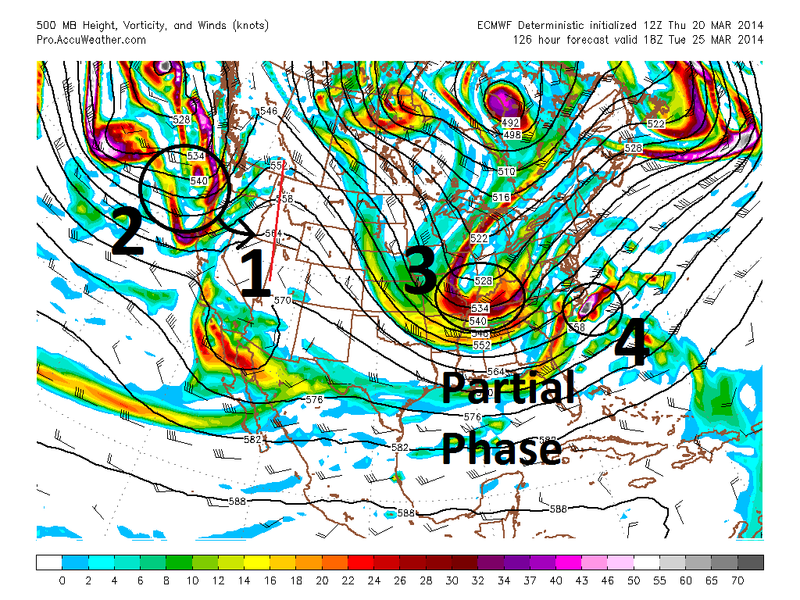 Below are the 12z Canadian and 12z gfs which actually show an even later phase than the European above. 2) The chances for accumulating VA snow are greatest from Richmond up the I-95 corridor to DC. 3) These chances decrease the farther west you go. Be sure to keep up with the latest forecast throughout the weekend. I'll continue to update my thoughts as we get closer.